Last week we had a somewhat desaturated Magnus the Red model sporting the colors of Tzeentch. This week we swing the opposite direction, with this extremely saturated Pink Horror. I love the colors on this. They're so bright and just really pop out at you. 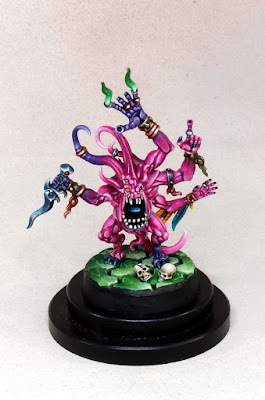 Incorporating the blueish purple into the outer extremities is a great way to add some variation to an otherwise monotone model, and also shows off the blending skills. Everything really is blended perfectly, with smooth transitions between both the shadows and highlights, as well as the various colors on display. When you look at the face you can see how crisp everything is as well, with the teeth and the eyes. There's no fancy conversion work going on here, but the model doesn't need it when it's painted to this level. 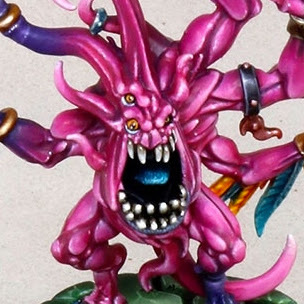 It doesn't hurt that they used the more interesting Horror from the Silver Tower box either. The base is fairly simple, with a basic jagged tile pattern sculpted onto it. The colors used really make the model pop even more though. The jade of the tiles frames the horror perfectly, while also tying into the magical flames on his hand, and being a believable color for fancy floor tiles. All in all, I think this is a great rendition of a model that many people might overlook for being too simple for a display piece.